A audacious project to send volunteers on a one-way colony trip to Mars is drawing up plans for simulation outposts on Earth to give potential Red Planet settlers a taste of Martian life. Mars One announced their plans for mock Martian colonies Thursday (March 27), though the nonprofit hasn't picked a location for the first simulator yet. Mars One also announced Thursday that it chose NASA contractor and capsule designer Kristian von Bengtson to lead the outpost project from Denmark. Mars One's earthbound "colonies" would hardly mark the first simulated Mars missions. The Mars Desert Research Station was established in Utah a decade ago to serve as an analog to the Red Planet during mock missions. An international crew of six lived in isolation for nearly a year and a half in a pretend spaceship in Moscow for the Mars500 project, which was carried out by the European Space Agency and Russia's Institute of Biomedical Problems. More than 200,000 people sent in applications for a spot on a Mars One voyage. Out of that huge pool, 1,058 aspiring spaceflyers were selected to move on to the next round in December 2013. 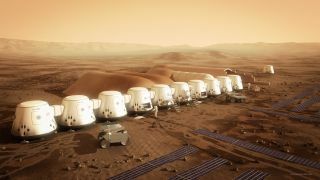 Eventually, just six groups of four will be chosen to become full-time employees of the Mars One astronaut corps. Company officials have said they hope to broadcast parts of their selection process on a reality television show. Mars One contends that it's possible to establish a settlement on Mars with existing technologies, such as modified Dragon capsules built by the private company SpaceX. The company hopes to first launch an unmanned demonstration and satellite mission in 2018 before beginning manned flights in 2025. The group recently raised more than $300,000 in a crowdfunding campaign on Indiegogo to help get that robotic mission off the ground.